Ten years ago, Manhattan’s Meatpacking District was in the process of gentrifying from a once desolate neighborhood—historically for slaughterhouses and derelict factories—to an emerging gritty-turned-glitzy, club and restaurant scene. In the 1980’s, the area was known for drug dealing and prostitution. With what seemed like an overnight regeneration, New York’s hippest hotels, like the Standard and members only Soho House, started creeping in alongside high-end designer wares like Alexander McQueen and Stella McCartney and haute restaurants like Pastis. With 2009’s iconic build of the High Line—Manhattan’s artistic over-ground park, which extends from the Meatpacking to West Chelsea—plus the current build of the new Renzo Piano-designed Whitney Museum of American Art at the footsteps of the High Line, the neighborhood has seen major overhauls since its slaughterhouse origins. Now, both luxury and independent boutiques line the cobble-stoned streets in this highly sought after Manhattan neighborhood. The designer boutique newbie, OWEN, is one of the most recent additions to the hood. One step inside the women and menswear boutique and the compact, contemporary, yet well-designed space greets you with a patchwork of beautiful, high-end clothing. Phillip Salem opened the boutique, which showcases innovative designers that are understated, timeless, and stylish. Some brands that populate the racks include unique pieces by A.L.C., Opening Ceremony, Wayne, Simon Spurr, Patrik Ervell, Surface 2 Air, Rogan, Warriors of Radness, and Robert Geller. Salem, an Ohio Native, moved to NYC dreaming of fashion and attended the Fashion Institute of Technology. After graduating, Salem built a name for himself. He covered Fashion Week, as WFIT’s New York Fashion Week Senior Correspondent, and interviewed designers and celebrities. He also produced “Entertainment Intervention,” which was a show that looked into dining, entertainment, and shopping in NYC. Salem, being well-versed in the fashion scene in NYC, sought to open OWEN after he realized there wasn’t many iconic places to shop for both men’s and women’s brands in the designer and contemporary market. 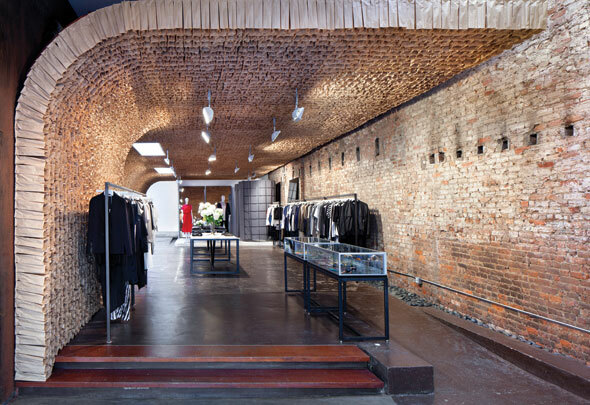 He says on OWEN’s website that “Fashion to me is a preference, not a rule, so I focus on pieces that are modern, structured, and detail oriented—with a subtle flair for the dramatic,” which is much like the elegant aesthetic of his new Meatpacking boutique. The store, designed by Jeremy Barbour of the Williamsburg, Brooklyn based Tacklebox, is housed in an elongated room that appears underground-like, accented with a wall and ceiling covered with twenty-five thousand brown paper bags. The paper bags arch from floor to ceiling and create an ethereal touch to the industrial space. Stacked continuously in rows hovering above the showroom, the juxtaposition of delicate, neutral-toned lunch bags with the industrial feel of the space creates a room that feels whimsical and organic, with its honeycombed appearance, while accenting the coldness of brick and concrete. The floor, burgundy brick walls, and minimalistic design of the showroom keep the brown bags from becoming overly designed. The clothes are displayed on steel, black hanging bars, and jewelry is displayed on quartz-slab tables and clean-glass vitrines. The paper bags on the walls have also all been treated with non-toxic, flame-retardant saturant. Barbour has worked with other retail brands, such as Saipua, Phillip Lim, and Aesop, and is known for using natural materials to create unique, innovative spaces. For the Australian skincare brand Aesop’s store on Nolita’s Elizabeth Street, Barbour designed the small space using over 3000 hand-shredded pages—from old New York Times newspapers—and swathing the walls in stacks to create a modern yet organic feel. And at Saipua boutique based in Brooklyn, Barbour utilized silver-stained pine siding taken from a century-old Shaker barn, which created an organic, rustic feel to the space. In addition to his work at Tacklebox, he also taught at New York Institute of Technology, Pratt Institute School of Architecture, and Columbia University, where he received his M.S. in Advanced Architectural Design. OWEN’s design is one that borders on contemporary, but it has the delicate, organic feel that is so often viewed in Barbour’s masterful works of art. The whimsical paper bags and concrete create an architectural landscape that is the ideal backdrop to showcase OWEN’s fantastic array of designer digs.